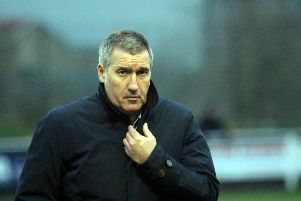 Banbury United boss Mike Ford was delighted to end the Evo-Stik Southern League campaign with a point and a clean sheet. But Ford felt his side deserved more than that in Saturday’s premier division stalemate at Tiverton Town. Ford told Puritans Radio: “When you get a group of players together, that is how you want them to perform every week, irrespective of whether it’s a game against a team at the top, bottom or mid-table. That performance epitomised what this club has been about for the last three seasons. The simple fact is United have not seen off the teams in the bottom half of the table, dropping points from winning positions, mainly through late goals. But another top ten finish in the premier division is another sign of progress.